The On-Demand Start-Up Program for Hospice was designed to introduce hospice business as a stand-alone service or addition to existing services. This program will help you understand CMS requirements for location, finance, operations, local, state and federal regulations, and personnel, as well as how to create effective billing, budget and other financial systems and processes. Administrative and clinical needs will be defined, with considerations for creating an action plan and timeline. A start-up hospice administrator needs to understand compliance and get answers to the: Who, Why, What, Where, How and When regarding hospice agency start up. Introduction: So You Want to Start a Hospice? 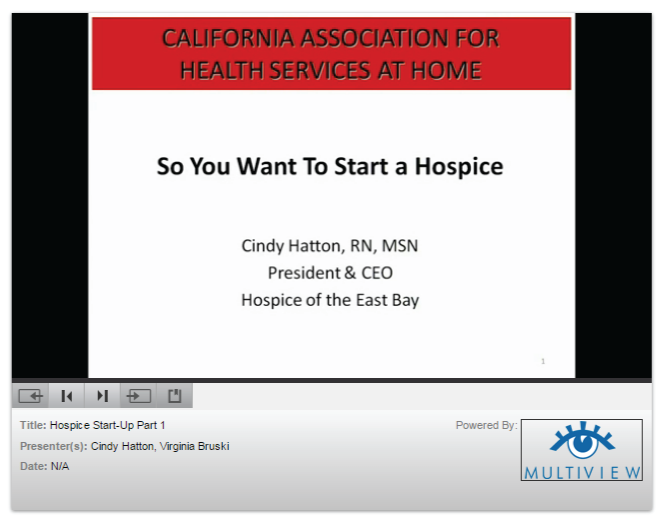 This session will describe the initial steps in starting a hospice agency, including needs assessment, selecting a name, vision, mission and core values statements. Regulatory, licensing and accrediting organizations and their functions will be addressed. How initial space, staffing and marketing needs are determined are reviewed. The Medicare Conditions of Participation (CoPs) related to professional and core services, policies and procedures, and organization administration are reviewed. Descriptions include contractual agreement requirements, and required policies and procedures. NEW California End of Life Option Act. The elements of a consistent hiring process, orientation content “must haves”, the role and job requirements of a Nursing Supervisor, and the importance clinician participation in the QAPI program will be addressed in this session. This session will detail the importance and location of the Medicare CoPs related to the function of the Interdisciplinary Team (IDT), major responsibilities of the IDT, members of the IDT and their roles. In addition, the relationship between the patient assessment and the plan of care, and a typical IDT format will be reviewed. Regulations about admission eligibility criteria, the admission process, election periods, Certification of Terminal Illness (CTI), and election of hospice care, and Notices of Election filing requirements, will be described. Circumstances when revoking the election of hospice care and change of designated hospice processes may be required will be identified. Patient rights, the initial and comprehensive assessment and when discharge from hospice is appropriate will be detailed. This session will describe the four (4) levels of hospice care. Symptom management issues that may require Continuous (Crisis) Care in the home, when respite care may be indicated, and criteria for admission to the general inpatient (GIP) level of care will be addressed. The Hospice reimbursement rates for all four levels of care and the NEW two tiered Routine Home Care rates and Service Intensity Add-on. Basic accounting requirements such as an operating budget, chart of accounts, balance sheets, and income statements will be described. Determining needed capital for start-up and resources such as an accountant/bookkeeper, electronic billing system, and financial software to manage the financial operations will be discussed. Hospice Item Set (HIS and CAHPS- Hospice requirements), QAPI regulations and essential elements for inclusion in a QAPI program will be described, including the quality assessment-performance improvement process, how the agency-wide infection control program is included in the QAPI program, when a hospice agency must have a CLIA certificate of waiver, and how a QAPI program can be structured, based on the NHPCO 10 Components of Quality. This session will present options for accounting software, Medicare billing software, payroll services, Human Resources software, education resources, and donor tracking software. Benefits of benchmarking and productivity subscriptions, and local and national trade association membership will be described. This session will discuss the link between regulations and compliance, define the role of the Medicare Administrative Contractors (MACs), and delve into the government agencies and contractors that are involved in CMS hospice oversight. Responsibilities and potential audits from QIOs, CERT Program, RACs, ZPICs, RACs, and the OIG will be detailed. HIPAA Privacy and Security Rules, including HITECH and Omnibus regulations will be reviewed, including requirements for Business Associates, authorizations to release PHI, patient rights, and definition of and required follow-up after a breach. The importance of systems in place to avoid fraud and abuse is emphasized. Essential marketing program components, including a marketing plan, and the key role of community liaison staff will be discussed, with the importance of preventing fraud and abuse related to referrals for hospice. 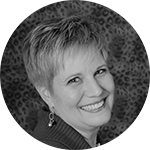 As the Chief Executive Officer, Cindy is responsible for leading the operations of Hospice of the East Bay and Hospice Foundation of the East Bay, as well as policy decisions of the governing Boards; Hospice of the East Bay Board of Directors and Hospice Foundation Board of Trustees. She plans, directs and manages the current operations, future growth and program development while insuring responsible use of fiscal, human and physical resources. She develops goals and objectives for the organizations. She represents Hospice of the East Bay to the community at large, the medical community and the community of donors, families, media and key stakeholders. Hospice Foundation of the East Bay is a non-profit organization formed in 1999, with a mission of obtaining charitable contributions and grant for the exclusive benefit of Hospice of the East Bay. The Foundation receives support from grants, community donations and fundraising activities and special events. In addition, the Foundation operates six thrift stores in Contra Costa County, which sell donated used clothing and household goods, and estate and vehicle sales. If you do not receive these emails please call CAHSAH at (916) 641-5795 ext. 113. Once you receive your login information you may immediately begin accessing your on-demand course. On-demand course content can be accessed 24 hours a day, seven days a week from any device that has internet connection. The On-Demand Start-Up Program for Hospice comes with a total subscription length of six (6) months. If additional time is needed to complete the course, you may purchase an extension period of two weeks.